Last week, I posted an article with a photo of my bare face (no makeup). To the left of me is a photograph of a beautiful woman named Chanel. At 23-years-old, Chanel is bravely fighting a devastating battle against major organ failure due to scleroderma. You can read the full article here. It’s difficult to articulate how much courage I had to muster before hitting the “publish” icon and send my naked face out for public viewing for the first time in my life. I have written extensively about how my disease,scleroderma, has eroded my self-esteem, body-image, and sense of self-worth since the age of ten. After 30 years of going to great lengths to conceal my face, I put it out there to illustrate how much more there is to people than what we see. Since the post got over 600 shares, I wanted to amplify my message by placing an ad on Facebook to promote the article. I’ve done this before with other popular posts and they’ve always been approved by the Facebook ad team. 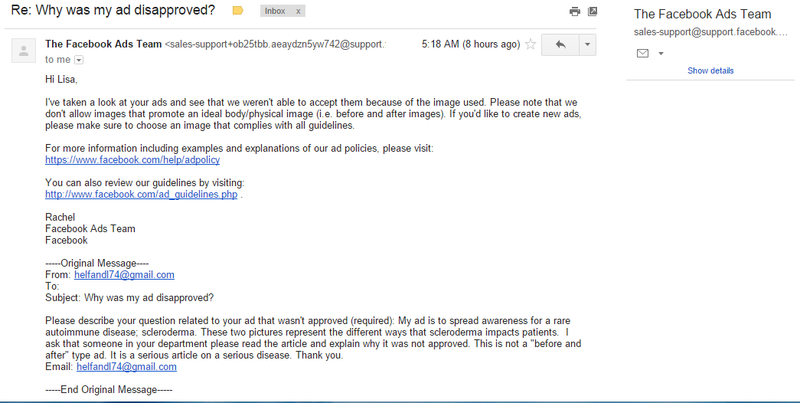 I received the response below, saying my ad was not approved. “Your ad wasn’t approved because it includes “before and after” images, or other images showing unexpected or unlikely results. It’s also recommended that you avoid focusing on specific body parts, because these images typically receive high negative feedback. Before resubmitting your ad, please visit our policy site to learn more and see examples of ads that meet our guidelines. At age 40, I have decided to share my struggles with my reflection in the mirror. My hope is to inspire others and promote positive change in the way we perceive beauty and elevate awareness for scleroderma in the process. When I posted last week’s article, I received incredibly positive feedback. Strangers told me I was brave and that what I did would help many women and girls. Friends texted me and told me that I am way too hard on myself and should consider going out in public without makeup. Although it was not my motive behind writing the article, I was exhilarated by the overflowing kindness I received. 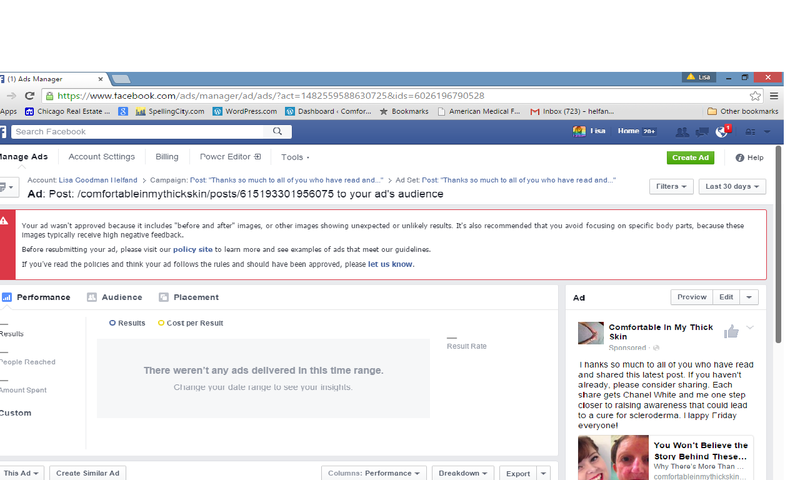 I can’t describe the emotional blow that accompanied Facebook’s rejection of my ad. At first, I hoped that I was not rejected by an actual human. I figured maybe Facebook uses software that detects possible infringements on their ad policies. Perhaps I received an automated response to my autoimmune disease? This did not make me feel better. The fact that my bare face would cause software to recoil in fear and set off virtual alarms was not a self-esteem booster. However, thinking that I was rejected by an algorithm, instead of a human gave me hope that this was all a misunderstanding. Then, I heard from a real live person. Her name is Rachel. I asked for someone in the Facebook ad department to read my article and Rachel said she had “reviewed” it, but that my “before and after” picture violates their ad policy. Despite my email explicitly explaining that my ad did not include before and after photos, it seems I am still in violation of their policy. I’ve been advised to “avoid focusing on specific body parts, because these images typically receive high negative feedback.” That said body part is my face. Does anyone else see the irony in my face violating Facebook’s ad policy? Would my scleroderma ravaged elbows, or fingers have been less offensive? I know some might say I’m overreacting to a random woman sitting in an office across the country just trying to do her job. I realize this is a trivial matter and a far cry from the tragedies that occur daily in our world (not the least of which is a 23-year-old woman who is fighting for her life—the topic I was trying to promote with my ad). This is a microcosm of a larger issue. The entire purpose of my ad was to reach a broader community and share the notion that we shouldn’t judge others by deceptive appearances. I wanted to depict the value in shedding preconceived notions about those who deviate from what we deem normal. Ridiculous as it may be for a 40-year-old woman to be enraged by a policy she knows in her heart she did not violate, I am pissed as H- E- DOUBLE HOCKEY STICK (strong language, I know, I need to simmer down. Seriously, I would write far worse, but my former students read my blog and I don’t want them to know their fourth grade teacher swears like a truck driver). My husband has told me he loves me for who I am and offered to call Marc Zuckerberg for me (ha ha). He seems to think that if Facebook accepts my ad, that will fix everything. While I love him for that, he’s missing the point. I’m not angry at a Facebook algorithm or Rachel from their ad team for rejecting the face that I’ve worked so hard to accept. I’m livid with myself for allowing the rejection to dictate my feelings of self-worth. I hate that this petty matter triggered such strong emotions for me. The trauma associated with the rejection my appearance has generated for three decades was unleashed in a profound way that I can’t explain. I write about rising above society’s obsession with materialism and outer beauty. I’ve often said, women just need to say, “who cares?” and focus on what’s really important in life. Yet, I allowed Facebook’s rejection to reduce me to a puddle of mush when they essentially told me they would not promote my face. Facebook originated as a demeaning method for guys at Harvard to compare and rate the faces of women. It has evolved into a wonderful tool that allows us to share, comment, like, and connect with people. I’m thankful for Facebook, as it is the primary method I use to share my writing. When you think about it, sharing, liking, and commenting are all forms of accepting our peers. Whether you’re 10, 40, or 100, everyone yearns for acceptance. I will not allow Facebook to reject my face. Please share if you agree. 7/29/15 Update: It took a call from Yahoo to get Facebook to reverse their original decision. Read the article here. Many thanks to the thousands of you who shared this post within the first 24 hours that it went live. Together, we are powerful! My faith in humanity has been restored. I plan to write a follow-up blog on this, so stay tuned. 7/30 Update: The saga continues! Turns out, the problem with my ad has not been rectified. Stay tuned for more information. Wow that is great Lisa! Who knew Facebook started as a FACE book? I thought it was for old NANAs to show off their grandchildren. I love your writing and you inspire me as I still put on makeup to go to the ER. You are wonderful! In all ways! Lesley- Thanks so much!!!! I’m not only hanging tough, but I am using all of the support and encouragement I have received here to start a movement to raise awareness! Keep checking this blog for details. Hope you’ll join us! Your articles are amazing, inspiring and I’m sure have heeled many with and without scleroderma. You are a crusader! Your articles are amazing, inspiring and I’m sure have helped many with and without scleroderma. You are a crusader! Wow. Thank you so much. I cannot tell you how much your words mean to me! As a physician, I am horrified when I read this blog. Obviously, this Rachel and the rest of the Facebook Ad team have no idea what scleroderma is and can do, and can look no further than the surface. I am disgusted how your ad could be rejected for posting an image of yourself and Chanel in your “natural” states and then with make-up. 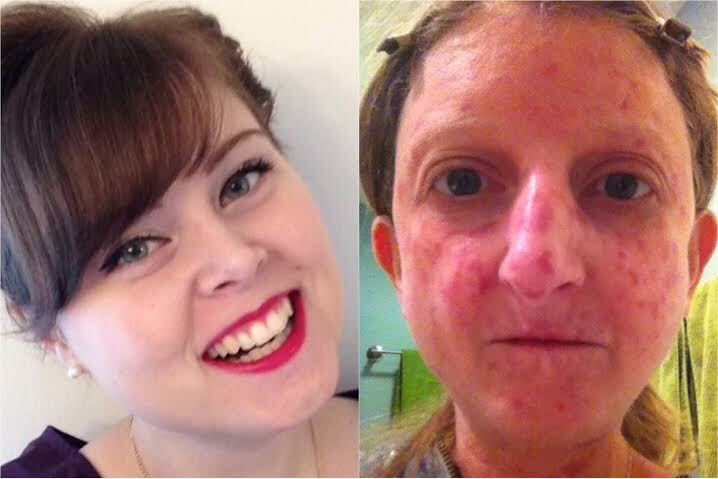 As you said, this is NOT a before and after ad; it is two very brave people fighting a potentially ravaging and disfiguring disease that you both have no control over. I am so proud to have you as my sister-in-law and impressed with how you have gotten your message out there regarding scleroderma. As the employees of Facebook have shown, there is not near enough understanding of this potentially devastating autoimmune disease. Facebook should reconsider, but then again as you have pointed out, Facebook has been based on image from the start. To see what Facebook allows people to post and then to have rejected your attempt to actually educate the public and raise awareness about a poorly known disease is very, very disappointing. Keep posting Lisa, and keep trying to get your story out there. People need to know that even with scleroderma that you are a smart, wonderful, loving, caring, and beautiful person, with or without make-up, and that life is not only skin deep. Thank you, Jason. Your words mean so much to me! You’re the best brother in law ever! Peg- THANK YOU! Means the world coming from you. Right back atcha! Good morning, Lisa! I was enjoying my breakfast until I read your comments about Facebook, and now the almond milk in my stomach feels like it is curdling! I am H-E DOUBLE HOCKEY STICKS annoyed with them, too! Have you considered asking everyone who originally responded, shared, etc., to the first posting with you and Chanel to send a response to Facebook demanding they publish your ad? You could also send it to the Scleroderma Foundation in Massachusetts, and the Scleroderma Research Foundation in California, asking them to send an email to their members and ask them to write to Facebook as well. Facebook is a wonderful resource for awareness, but I wonder how aware THEY are. Rachel’s response makes me wonder if she did anything other than take a 1 second look at your photo and Chanel’s photo. I still KNOW how beautiful you are inside, and there is nothing wrong with your outside either! Thank you for your note and support! It is obvious that the people on the FB ad team do not understand what they are reading. Maybe they should be inundated with mail explaining in first grade language what your goal is in placing the ad. Personally I don’t care how you look. It is not what is on the outside but rather what is on the inside. Your inside is kind and caring, funny and smart. It doesn’t matter how you look. I still love having your as a friend. Thanks… you are so sweet! You stay on the high road, Lisa….. and let us, your readers, fight this one for you. It is ridiculous that your post was rejected- the message is exactly the opposite of what they are doing by rejecting it. Yes- the irony is thick. How can we all share this on Facebook? Inundate Facebook with this post! Thanks for your note. Please share my story to your other Facebook friends. Lisa- How do I share this post?? I am angry at Facebook for you. Hopefully, raising awareness of this will continue to break stereotypes. Sharing this! You are inspiring and courageous! I get it. I have scleroderma and have a leg that is full of thick skin, I know how it makes me feel and have no worn shorts in years. Sending you love and blessings! Thank you! Sending love right back to you! I share the indignation of these people who have responded to your beautiful words and the blind refusal of Facebook to allow them to be widely read. Please know that you have the admiration and support of many of your readers. I should be proud for a child of mine to have you for a teacher! Thanks for being a warrior along side me. Take care!! There is so much I find wrong with the FB rejection, including the fact that I get plenty of offensive “ads” in my stream as they search through my posts and “likes” to make assumptions about me and my interests. Your writing and topic is far from offensive or “before and after”. Continue on my brave warrior! From one Scleroderma Warrior to another, You are a True Hero! And I totally get it! This Rachel person at Facebook is obviously drowning under mountains of before & after ads if she thinks that’s what your picture/post was about. I have scleroderma and I post pics but my disease hasn’t affected my outer skin; it wrecked havoc on my internal organs, lungs and kidney. In which I needed a transplant of the lungs and right kidney. Your article is powerful and I’m thankful for a strong-willed individual to step out front for this cause and advocate about this horrific disease. People just don’t understand what their not familiar with. Be Blessed! Hey Facebook. You are missing the point. This is about a terrible disease and trying to make people more aware of it. Not about “perfect body image”. Your complete lack of sensitivity towards this issue is disturbing and classless. Your gumption is just as beautiful as your face!!!! 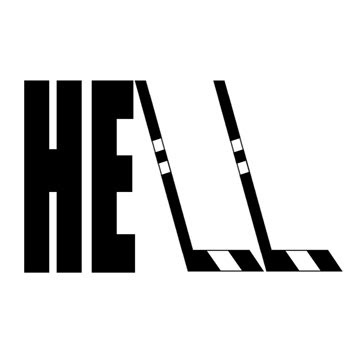 Give them hell! Dont let stupid rachel off with it, sned her back a link to this post! Thanks to people like you those of us new to scleroderma have someone to show us there is life after. I found out last year about mine which so far only affects my hands and fingers. Facebook is named right FACEbook for a reason started by men whom only look at the outer beauty not the inside, so shallow. Maybe with time they will grow up. God bless you. This just puts FB in the same blacklist as Judge ignorant Judy and her comparing people with Lupus as being same as drug addicts. That’s just ashamed. I admire you and all you’re doing for this awful disease. My sister and I are battling Lupus. My sister also is living with schleroderma. We hope to find a cure soon. Stay strong and jeep doing what you are doing. Sharing on FB and hoping that all my friends do…i want this to go viral because of facebook’s idiocy and ignorance. Their generic and canned responses sicken me and I think you are a lovely woman just the way you are. Chances are the person reviewing the ad didnt even read what you wrote and just skimmed the notes the algorithm place on it and replied. WTF facebook get your crap together. Even after explaining that they are not ‘before and after’ pictures multiple times, they still don’t get it? Just stupid. Don’t let stupid facebook determine ANY of your self-worth. I can only imagine what you go through, you are not worthless. You are a person, and all people are worthy of respect and kindness and compassion and encouragement. Continue to be your brave self and set an example for others who need that encouragement and support. Lisa, your courage and commitment is inspiring. My mom was finally diagnosed with scleroderma after years of misdiagnosis. She had her insides and outsides ravaged by this disease and sadly died 7 years ago at age 73. When we found out she had scleroderma, we couldn’t find anyone else who had ever heard of this disease. My family felt alone. Keep up the fight- there are many standing with you. I find this just incredibly insulting that they would do this! Well done to bringing this to our attention – and raising the awareness of the REAL impacts of Scleroderma! I don’t have scleroderma–just insomnia–and came across your writing on xojane while trawling the Internet at 4 am. Your writing inspired me, but maybe not for the reasons you’d imagine. If you were simply a good writer with a terrible disease that you were dealing with with grace and guts and humor, I wouldn’t feel too inspired. In fact, if I were operating true to form, I’d probably think something like, “See, some people are so much better than me. I have far fewer physical problems, yet I don’t have her resilience and toughness.” I’d use your warrior club on my own self-esteem, if you see what I mean. That is so vauable to know, that our vulnerability can connect us as much or more than our confidence. Thank you. Thank you for sharing your story – we posted this link over on our Graves’ Disease & Thyroid Foundation’s Facebook page. Appearance changes can be devastating for patients living with autoimmune diseases; with Graves’, patients can experience bulging and swelling of the eyes as well as double vision, dry eye, tearing, grittiness, and light sensitivity. Dr. David Granet from UCSD Shiley Eye Institute commented on living with thyroid eye disease: “We found levels of depression that rival cancer and AIDS…not looking like yourself hit people even worse than double vision.” Many patients completely withdraw from work and social situations, because the appearance change so profoundly affects how they interact with the world and vice versa. Please keep up this important work – hopefully, Facebook will change its “before and after” policy so that autoimmune patients everywhere can continue to share our stories. Pingback: Woman With Scleroderma, A Rare Skin Disease, Describes ‘Emotional Blow’ After Facebook Rejects Photo | Never Let Go ! Was there ever an update to this? I found this blog in a google search for some topical steroid side effects that appear to be giving me small red patches on my face. I would never post pictures of it, too insecure. Here you are dealing with a chronic, serious disease with much more severe effects on your skin and you uploaded it purely to help others. I really wish I had the type of courage you have. I hope whatever happened with this, you didn’t lose your resolve.